Great place, super friendly staff, good atmosphere and good location. I stayed at this backpackers on fellow traveller's recommendation and this place was really worth it. Ample facilities, amazing location, fun hosts and awesome travellers and hostellers! Would definitely recommend this to people travelling in Cape Town. PS: Make sure to be at the bar at 2230 for some crazy fun and free shots! Great hostel in a prime location of Long Street. Hostel is centrally located to all walking tours, bars, restaurants and an uber ride away to V&A Waterfront. It is a great hostel to socialize and the staff are great too. Really friendly and helpful staff! Awesome atmosphere with a bar and verandah and a locker to store your things in :). A really nice hostel, the staff are on point. 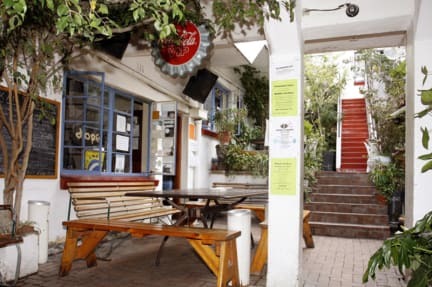 It's more of a party hostel than anything and it's on the most lively street in Cape town so it maybe a bit loud but not that bad. All round a good time though! Amazing location in the heart of Long Street. Room itself was a bit so-so and it didn’t have a shower so had to use one on the other side of the hostel. But other than that it was fine, nice for a few nights. Great place for budget stay or long stay. Long Street Backpackers seems like a bar first and a hostel second. Staff were super friendly, the party was lively when I arrived, can recommend it as a good hostel if that's what you're looking for. However, this probably isn't the best place to stay right after a long flight- find somewhere quieter if you plan to be tired. I would not recommend staying here. Incredibly hot rooms with no fan or a/c. The "private rooms" are actually located inside a shared dorm room (have your own door). The “bar” is actually a fridge of beer that you get yourself and 5 stools at the check-in desk. Long Street = tourist street where lots of criminals hang out. Locals avoid this street for good reason. Bad refund policy - paid for 9 nights and left after 3...management told me it was unheard of to refund any money.